10 french media groups just announced that they will be launching a shared ID service aiming at making users’ life easier. The idea is to allow user to have a single account (email address, password) to access all media websites. This new service is due in the summer of 2019 and will cover 80 websites edited by those 10 groups (Le Figaro, Altice, L’Équipe, M6-RTL, Lagardère Active, Czech Media Invest France, 20 Minutes, Les Échos-Le Parisien, Le Point and Radio France). While the idea seems compelling on paper, its very nature suffers drawbacks that will impede its success. Read this article to understand why reflecting on past failures would have been crucial to ensure success. 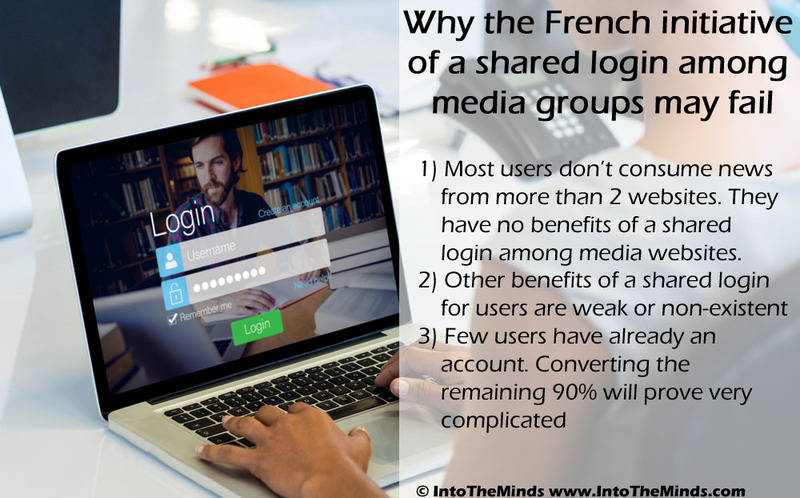 The idea of a shared login among media groups has already been at the heart of a projct launched in Belgium in 2012. The project, called “media ID”, counted 37 websites and 8 media groups in July 2015. It ceased to exist in 2017. The peculiarities of Belgium (2 languages, small market) certainly played a role in the failure of the Media ID initiative (in particular the lack of commitment and courage that prevented this initiative from being countrywide). creating an ID is still a hassle : what is the added value for the user ? Are the benefits of logging in clear and understood ? is there added value from the consumer of going from one site to the other with the same login ? 78 percent of users get the majority of their news from a single publication, and 94 percent get a majority from at most two sources. To understand the value that a shared ID across different media sites can represent, we need to explain the correlation that exist between beliefs and news consumption. Gentzow and Shapiro (2010) have coined the term “Ideological Segregation” and have produced several very interesting pieces of research, one of which is entitled “Ideological Segregation Online and Offline”. The starting point of their work is Sunstein’s book Republic 2.0 and Pariser’s theory on filter bubbles. Here is the weakness of a shared login : users don’t display a natural tendency to consume from various news outlets. Hence the value they’ll get from a shared login will remain very limited. The percentage of paying customers on news outlets remain low. The 2018 Reuters Digital News report estimates that an average of 14% only have paid for news in the last 12 months. It means that 86% of users on average consume news without paying. In the absence of subscription to access content users will remain reluctant to create and use a login (except if it’s mandatory). The studies mentioned above show clearly that an overwhelming majority of users don’t consume from more than 2 websites. The benefit put forward of “logging in more rapidly to several websites” is therefore at best very weak, at worst non relevant. With 94% of users consuming news from only 2 websites in the US, the likelihood is pretty high that this statistics will also apply to France and that users will not show a tendency to consume from more than 2 websites. Think about your own behavior and habits: you probably go to the same 2 websites to get informed, don’t you? And the likelihood that you don’t log in to get informed is also pretty high. Our guess is that an outlet like Le Figaro has at max 10% of logged in users (Reuters’ average for France is 11%). Converting the remaining 90% looks like an insurmountable task. The announced benefits of logging in are weak. Bertrand Gié, a Director at Le Figaro, explained in an article that users who be able to resume their reading on another device. Whereas this functionality makes sense for video or audio programs, its relevance for article is questionable to say the least. Apart from the easiness to connect to several media outlets, the added value for the user of using a shared login is non-existant. The alliance foresees to share only the email address of the user which will prevent them from recommending them content from other members’ websites that they may be interested in. This is all the most pity since data portability is an integrant part of GDPR. Shared login is a growing trend among media groups which are lookin for ways to depend less on Facebook. There are discussions ongoing in the UK to hve such a shared login, and two systems (NetID and Verimi) are already coexisting in Germany. The French project follows this trend but fails to propose any added value to the consumer. This project seems to revolve only around media outlets’ interest for targeted advertising. We believe that the lack of focus on real consumers’ benefits will impede the odds of success of this project.